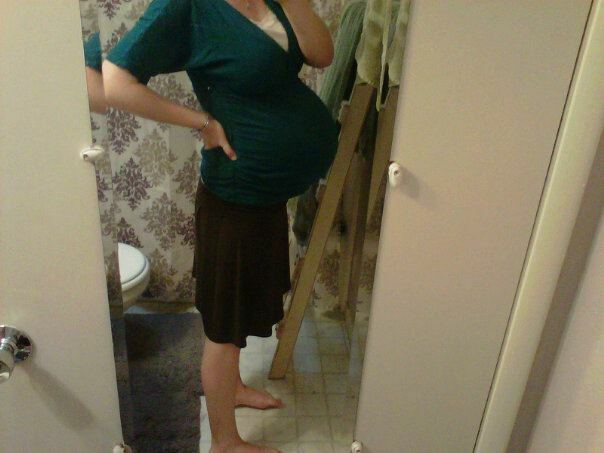 This was me at 37 weeks. And I got bigger. Ouch. Regardless of how much one might think I like to sit around and dream up ways to get people upset, I truly think that I have a unique perspective on this subject, having done both sides of the equation. So hear me out. I’m not here to rile, just to present my experience. The topic of where you decide to shoot your baby out is rifled with controversy. I’m not going to lie and judge other moms for caring or imposing their opinions on others. I’ve been there, I do that. For some reason, there’s this part of the Mommy brain the jumps into “High Alert” mode every time pregnancy or childbirth is mentioned. I don’t think that the only reason moms tell you what they think is because they need validation for THEIR particular choice. Moms have this protective nature that causes them to want to protect others and their children too. I think it comes from a very good place. But we have to protect both sides of the equation as well– the baby AND the mommy. The baby’s health should never be compromised, true, but every woman is a victorious champion for giving birth. There is no harder thing to do, whether you have a 2 day labor or a 2 hour labor (side note: faster labors are often scarier, more painful, and traumatic!). I’ve had one baby at a Birth Center (essentially, a home birth, as there is no access to any drugs or doctors, just you and the midwives), and one at a Hospital. I’ve seen this scenario before, but it usually goes the other way around. Often, the first birth is at a hospital and is so traumatizing, the mom decided to go all natural the second time around (Business of Being Born, anyone?). In this case, comparing the two isn’t really fair or accurate. The first birth is ALWAYS traumatic, in certain ways. They don’t call them pioneer babies for nuthin’. A mom who has her first baby with an epidural and then has her second at home isn’t comparing apples to apples. Second births are an ENTIRELY different story, 99.9% of the time. What was once a clogged drain is now a salad shooter. Um-hum. Went there. So…ready for the crazy part of what I’m about to say? I had a more natural birth at the hospital. Yup. Darn tootin’. There were a few reasons for this, mainly, the fact that Gregory’s birth wasn’t so much of a clogged drain issue as it was a BABY WHO REFUSED TO TURN issue, but the biggest issue came down to the midwife. Hear me loud and clear– not all midwives are created equal! Just because she has the name, “midwife” doesn’t mean she will make the right call when the time comes. This goes for midwives who work in birth centers, hospitals, or even at home. A friend of mine’s home birth ended in a c-section, and she mostly blames the midwife’s decisions and techniques. Birth Center Birth, 2010 (read the complete story here): No drugs, no access to a birthing pool (one girl got there before me and got first dibs on the room with a tub– sad! ), induced labor by breaking my water, IV drip for dehydration (I couldn’t keep ANYTHING down, so I was losing energy fast! ), episiotomy and stitches. That last part may seem like TMI, but it’s directly relevant in the comparison, I assure you. 99% of the people I’ve talked to were aghast that any midwife ever agreed to do one, especially on an unmedicated woman. They also attempted to turn Gregory’s head during contractions by pulling and yanking on things that should NEVER be pulled and yanked on while in the middle of a very painful birth. Instead of turning him, they just ended up sapping me of all my energy and will to live, to the point where my contractions were doing nothing by the end. Usually, you want strong contractions at the end, right? To push the baby out? Mine were weaker than in pre-labor. Summation: Yes, I was allowed many of the things I wanted in a birth, like music and candles and whatever food I wanted, and since I was nervous about the “first time”, the birth center’s close proximity to the hospital was a HUGE plus. But my midwife was aggressive and didn’t let the scenario play out like it should. When you induce labor, it brings on the TOUGHEST part right away, with no chance to let it build up. I was a week ahead of my due date, for crying out loud! Why was I induced? Everything was a domino effect after that, in my opinion. I didn’t quite realize how traumatic things were until I had a second birth and saw how different things could be. I was grateful for a natural birth, but I knew that things hadn’t gone great. Hospital Birth, 2011 (read the complete story here): Due to insurance reasons (um, 100% paid for? Sign me up), we went with a CNM midwife through our local hospital. This time, however, I did oodles of research and realized that French Hospital is distinctly unique for their approach to labor and delivery, which is also why they don’t take complicated births. Their team of lactation consultants was founded by the woman who wrote “The Complete Book of Breastfeeding”. I was allowed whatever food, music and clothing I wanted (no hospital gowns for this girl!). I was never given an IV during labor or delivery. I was able to use the FREE birthing tub that they had waiting for me when I arrived. I did have to get out right before pushing (hospital rules), but if I hadn’t, AJ might not be here today due to his complications. AJ never left the room for tests, and we were able to refuse any and all vaccines and tests that we wanted. I had a lactation consultant ready for me at the push of a button, which meant that AJ and I were a total dream team from the start (he regained his birth weight plus 5 ounces by Day Three!). When AJ came out with the cord wrapped twice, completely blue and not breathing at all, a team of 3 nurses were able to bring him back while my midwife was able to stay with me and deal with my immediate post birth issues. And, when my after birth emergency complications crashed down on us, I had a full team ready to help me. I think there were 5 people in the room when it all went down. The quickness of the team meant that I didn’t need a blood transfusion. And when I asked/begged for an epidural? The stereotype would tell you that they pushed it on me, or at least acquiesced. Instead, my midwife chuckled and said, “Oh no, you don’t need that.” Also, she drank BEER with me right after delivery, right there in the hospital. How cool is that? Summation: Although it was a “sterile hospital environment”, my doula (who also gave me prenatal and postpartum massages at her yoga studio!) brought music and scented oils to make the most of things. Having a heated tub waiting for me was the bomb. I had the same CNM the entirety of my birth, the next day, and for all my postpartum checkups. My post partum nurses were as sweet as can be, and one of them prayed with me during my delivery. The only “drawback” was the fact that they were required by law to monitor AJ’s heart rate more than I would’ve preferred (it’s rather painful to sit still when you’re in the later stages of labor). I would choose French Hospital again in a heartbeat, since I know that they would never force any interventions on me, yet I get to save thousands of dollars by having the birth for free. Would I choose a different hospital in another city? Not without a ton of research and skepticism. But it can be done. As far as birth centers go, I don’t think I would ever choose one again. I would definitely go the home birth route, were I to have another baby outside of a hospital. The biggest thing that stinks about a birth center, in my opinion, is that you have to drive home 6 hours later! For us, that was a big pain– Jesse had just stayed up with me for 32 hours! He was incredibly sleep deprived, as was I (obviously). We had to drive home, get settled, then deal with a newborn without ever getting a chance to rest. I loved that I got to stay in the hospital for 2 days, with all my meals brought to me and someone to come rushing at the push of a button whenever I needed more Ibuprofen or a new heating pad. Because Jesse wasn’t doing the basics of caring for us, we were able to spend 2 days enjoying our newborn. The only drawback was how much I missed Gregory, since he couldn’t sleep at the hospital with us. Whew! Does anyone else have an opinion about birth centers/hospitals/home births that they’re willing to share? I love hearing other people’s experiences! Truly! I’ve never had a birth center birth so maybe it’s not fair for me to judge, but to me it always seemed like the worst of both worlds. The best part of a home birth is you’re at HOME. With all your own things and in your own environment. You don’t have to pack anything, you don’t have to go anywhere while in labor or shortly after birth. You have the baby, hop in your own shower, grab pjs out of your own dresser and fall asleep in your own bed. There’s no worrying about what to pack or when to leave because everyone comes to you. If we absolutely couldn’t afford a home birth, I think I’d choose hospital. Like you said, it’s all about the attendant. Theres horrible midwives, amazing ones, and a bunch in the middle. same with doctors. I have a friend who just had her 9th child at twin cities and had the most amazing experience. The doctor sat back and let her husband catch the baby, clamp and cut the cord etc. her first was a horrible hospital experience, her 2nd was a home birth with a midwife, her next 6 were unassisted home births and she said the last one was one of her most peaceful births. Ultimately I think it’s up to the woman giving birth. If they haven’t done any research, or aren’t willing to refuse to consent to things they don’t want then the chances for a traumatic birth experience go way up. I know I’ve read both your boys’ birth stories before, but I’m reminded again how your first reminds me of Nell’s birth, too — baby who refused to turn and midwife I ended up hating. 🙁 Although mine wasn’t too aggressive — she was too hands off! I thought I wanted someone hands off i.e. not prone to unnecessary interventions but she didn’t do much of anything, didn’t even tell me what was going on or explain how Nell being posterior was affecting things. I ended up spending days being confused about why my labor wasn’t following any labor patterns I had learned about, and my midwife just patted my back and said, “You’re doing great.” In the end I think any good midwife should be able to tell when a woman crosses the line between laboring and real suffering… I reached the suffering point and thankfully, my CNM friend with me (sort of serving as a doula) really advocated for a hospital transfer at the point, and things started improving. Phew, I still have anxiety over how that whole birth went, even though Nell is fine and all ended up okay. With # 2 on the way we are tentatively planning on using a birth center, but I’m keeping my options open while I process and think a little more. However, our nearby birth center is actually on the campus of the hospital where I ended up delivering Nell, so if there are problems or a laboring mama wants drugs, it’s just a wheeled ride across the street and you’re in the hospital. You can also choose between going right home after the birth (when you’re ready) or going to stay at the hospital for up to two nights. I totally agree with the above commenter about potential benefits of home birth though, and while my own attempt was kind of traumatizing, I still agree with home births in theory! IF we ever have more kids after this one it’ll be interesting to see what we decide. “When a woman crosses the line between laboring and real suffering”…so true. I remember being mad around the time of your birth, because I knew 3 people who’s homebirths ended poorly. I think there’s a lot of hype and a lot of “you SHOULD do this as a responsible mother” stuff thrown in, and the reality is that first babies are just HARD! I had both of my children in a hospital with a nurse midwife (the same midwife for both kids). Both births were fairly uneventful in regard to my kids, but both times my blood pressure went way down & I needed oxygen & meds. The hospitals (I had them at 2different hospitals) respected all of my wishes & like you I really enjoyed that time with just my husband & my newborn & not having to worry about anything else! Would you mind sharing the names of the hospitals? Just in case I ever wind up in another city? 🙂 Good hospitals are there, you just have to find them (my mom’s a nurse, and she would agree with me). Really proud of you for sharing this. You’re right that it can be a sensitive subject, and as with everything in “motherhood” we are usually trying to justify ourselves. Everything, and I mean everything is coloured by our own experience. So with that I will say that in my area there is no option for a home birth, or birth centre. We do not have midwives here on my little island, so the hospital is your only option. That being said, as a Doula I have had wonderful experiences in a hospital setting. I have had both women who are vehemently opposed to any form of intervention and have their guard up toward any Doctor and nurse, only to be met with patience and understanding, I have also experience these women who have been met with resistance to their preferences. I have also experienced women who have a more laissez faire attitude toward their birth and have have had both excellent and poor experiences. All of this is basically saying that no birth is alike. It is all dependant on your caregivers who happen to be in the room. I DO believe though that you can prepare yourself for your birth, wherever it will be. I believe that having a Doula, who’s sole role is to be there to support you and you wishes is KEY! This way no matter what “goes down” with your other care providers you know that there is someone who is there just for you, who knows your wishes and preferences and who will advocate for you, calm you and educate you. Before I became a mom I thought that the only way to go was a home birth. In some ways I still have a romanticized view of home births, and one day I would love to experience it. However. Hospitals certainly have their place. Hazel was breech and was turned at 38 weeks, her umbilical cord was down close to my cervix and her head was pushing on it each time I had a contraction, essentially causing her heart rate to drop significantly. Because of all of this, I did not have the birth that I wanted to have. She also had an issue with her lungs that had we not been at the hospital, would have been life threatening. Untimately I think that if you can find a hospital that is geared toward women, that is doing their best to make the experience easier on the mom and not on the doctor, than I think you will be doing well! Sorry that I just wrote a book! haha! Hannah, thanks for weighing in! Where you live sounds so different and interesting! I’d love to hear more about– maybe a series of posts about how different your island is in many ways that we call take for granted? Well I have never had a home birth or a birth center birth but I have had three hospital births. I really think each hospital is so different and so are the people that attend to you at your birth. I had all three of my babies delivered at Sierra Vista and sometimes I think that hospital gets a bad rap. But all three of my births were uneventful and the staff were very accommodating to what I wanted. I used the shower with my first and hung out in there for hours. I used the tub with my second and hung out there for hours though I didn’t feel that it helped much. My nurse with my second was AWESOME and I requested her again for my third….and got her! With my third I went against the grain and got an epidural. I just really wanted to try one. The hospital again did what I wanted even though my nurse said I was the poster girl for natural birth. And no haters, but I LOVED that epidural. I felt so much more present then with my other two. And Kelly, I am like you. I loved staying at the hospitals and always asked to stay as long as I could. Cable TV, meals, meds, lactation help, someone to watch the baby at night, were all things I loved and wanted. I felt so physically vulnerable after each birth I couldn’t have imagined having to get up and leave. But like you said, each woman has different wants and desires and things that are important to them. I am glad there are options available for all types.